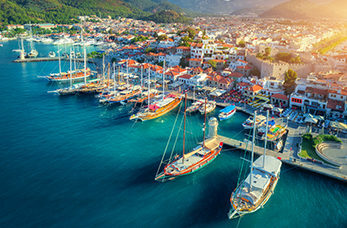 Set on Turkey's Turquoise Coast Marmaris is a Mediterranean resort town with a long palm-lined seafront promenade, a marina and a charming old town. It sits in a valley between pine-forested mountains and the clear waters, which are popular for sailing and diving. Treat yourself to a Turkish bath experience treat your body to some pampering and relaxation in one of Marmaris beautiful hammams. Trace the steps of ancient Romans and immerse yourself in the ruins of this ancient city, which was once an established port and trade centre of the ancient world. Marmaris Castle was first built by the Ionians in 1044 B.C and was the assembly point for 200,000 troops for Suleyman's troops. Inside a small museum exhibits glassware, coins, ornaments, tombstones and figurines. Head to the biggest waterpark in Marmaris, it's packed full of attractions such as numerous slides, a kids pool, a wave pool, mini golf, bowling, restaurants and bars guaranteeing fun for the entire family.